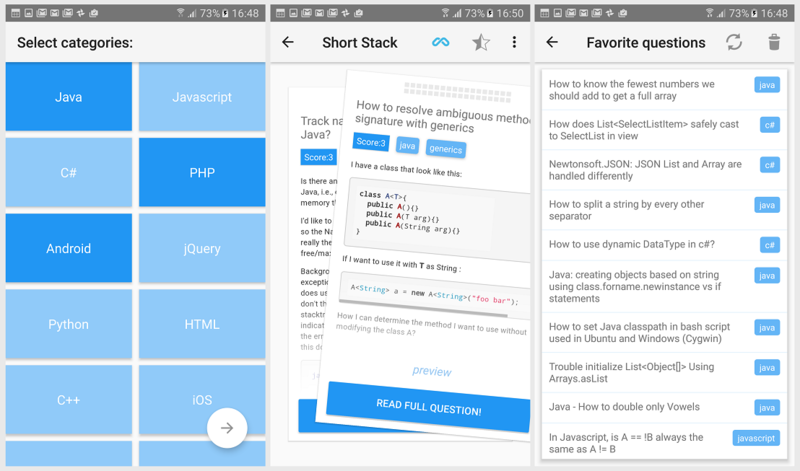 We would like to present our new Android app, ShortStack. If you ever found yourself lost in hundreds of questions posted every day on StackOverflow, you might want to check it out. The idea was to help us keep up with the most interesting new StackOverflow questions. By interesting, we mean the recent questions that we would be able to learn something from. At the same time, we did not want to spend a tremendous amount of time checking the website every couple of hours only to see a bunch of new unanswered questions with little added value. Same thing with the long questions with hundreds of lines of code, sloppily copypasted from somebody’s IDE. So, we spent some time creating a nice app for this. When you open it, ShortStack asks you to choose the programming categories you are interested in. You can choose multiple tags from the most popular ones offered by StackOverflow. Once you confirm your selection, our filters take on the job of finding the right questions for you, taking into account factors such as question popularity, score, length and whether there is an accepted answer. After a short while, you can simply start skimming through a stack (pun intended) of question cards. If you find an interesting one, read it, get the answers and then back at the stack swipe the card to the right. Should you find it boring, just swipe left. As simple as that (any resemblance to some existing dating apps is completely coincidental). As mentioned before, once you find the right one, you can get its full contents and delve into the details by pressing a button. If you find a question truly interesting and would prefer to keep it for later, you can add it to favorites and get back to it whenever you want. To get the app, just go to its Google Play Store website. Let us know what you think about it and share your feedback with us. We would love to hear suggestions! Below the download button, please find some screenshots from the app.